BigBangCasino.com, Europes largest internet casino, play, and win real cash prices. Subscribe now to receive your 100% depositbonus! Highest commission in BigBang Affiliates! Step into the billion dollar industry that's called online gambling. If you are not a beginner in the field of affiliate marketing and you know better than anyone else what your websites traffic is worth! Than join us now! 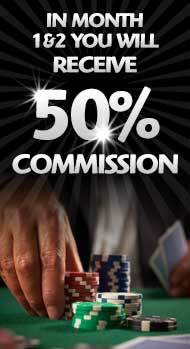 BigBang Casino offers affiliates a high commission up to 60% on the net return. When you register with BigBang Affiliates you will receive the standard 50% commission. After these two months you will receive a commission based on your sales results! But your commission will never be lower than 35%. Cooperation is the key to success! Are you the webmaster that we are looking for, and do you want to earn a lot of money in this growing market? We know better than anyone that cooperation is the key to online success. BigBang Affiliates is a reliable program and plays their game according to the rules! There are several reasons why you should promote BigBang Casino. See below what can you expect from us. Bigbang Affiliates is GOLD sponsor of Gaming Affiliates Guide Gaffg. BigBang Casino offers a wide range of exciting casino games from Play'n Go, Microgaming, Art of Games and BetgamesTV. BigBang casino also has a wide range off exiting self made games, with an excellent mix of graphic animation and sound effects. The BigBang Casino customer service is open 24/7 for affiliates and players. BigBang Casino offers various payment options such as PayPal, Moneybookers, Neteller, KBC (Mister Cash), Credit card; Visa, Mastercard and prepaid through the Paysafe card. You can also use phone payment (only for NL and Belgium).